Given that the number is divisible by 3, where a is a digit, what are the possible values of a. If x is a digit of the number is divisible by 3, find possible values of x. If x is a digit of the number   such that it is divisible by 9, find possible values of x. Given that the number  is divisible by 9, where y is a digit, what are the possible values of y? If  is a multiple of 11, where x is a digit, what is the value of x? If   is a number with x as its tens digit such that it is divisible by 4. Find all possible values of x. A natural number is divisible by 4 if the number formed by its digits in units and tens places in divisible by 4. A number is divisible by 11, if the difference of the sum of its digits at odd places and the sum of its digits at even places is either 0 or a multiple of 11. Find the remainder when 981547 is divided by 5. Do this without doing actual division. If a natural number is divided by 5, it has the same remainder when its unit digit is divided by 5. Here, the unit digit of 981547 is 7. When 7 is divided by 5, remainder is 2. Therefore, remainder will be 2 when 981547 is divided by 5. Find the remainder when 51439786 is divided by 3. Do this without performing actual division. Sum of the digits of the number 51439786 = 5 + 1 + 4 + 3 + 9 + 7 + 8 + 6 = 43. The remainder of 51439786, when divided by 3, is the same as the remainder when the sum of the digits is divided by 3. When 43 is divided by 3, the remainder is 1. Therefore, when 51439786 is divided by 3, the remainder will be 1. Find the remainder, without performing actual division, when 798 is divided by. Therefore, the remainder is 6. 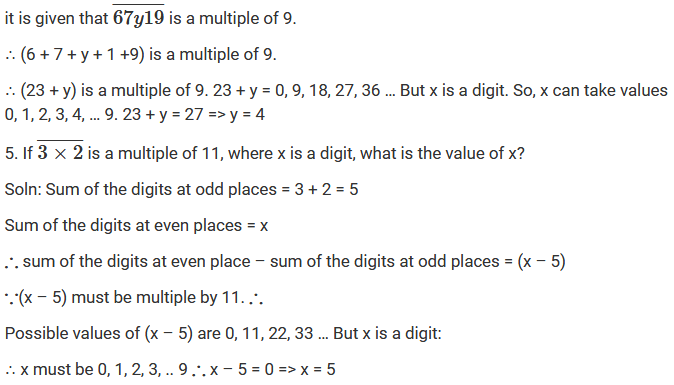 Without performing actual division, find the remainder when 928174653 is divided by 11. = A multiple of 11 + 10. Therefore, the remainder is 10. (iv) both 4 and 8 but not by 32. (i) 10 Every number with the structure (4n + 2) is an example of a number that is divisible by 2 but not by 4. (ii) 15 Every number with the structure (6n + 3) is an example of a number that is divisible by 3 but not by 6. (iii) 28 Every number with the structure (8n + 4) is an example of a number that is divisible by 4 but not by 8. (iv) 8 Every number with the structure (32n + 8), (32n + 16) or (32n + 24) is an example of a number that is divisible by 4 and 8 but not by 32. (i) If a number is divided by 3, it must be divisible by 9. (ii) If a number is divisible by 9, it must be divisible by 3. (iii) If a number is divisible by 4, it must be divisible by 8. (v) A number is divisible by 18, If it is divisible by both 3 and 6. (vii) If a number exactly divides the sum of two numbers, it must exactly divides the numbers separately. (viii) If a number divides three numbers exactly, it must divide their sum exactly. (ix) if two numbers are co-prime, at least one of them must be a prime number. Every number with the structure (9n + 3) or (9n + 6) is divisible by 3 but not by 9. Every number with the structure (8n + 4) is divisible by 4 but not by 8.